A lot of adjectives crossed through my mind when I read "No Institute is an Island" in today's Hindu. The politest rephrase is, Media and sense seem to be an Oxymoron. When my 2 year old reports one or another kid hit him, my first question is what did you do? When the same thing happens to a photo-journalist, the only even in your newspaper is, Journalist beaten up! Any word on anything he did to provoke is missing. How is that fair coverage? I get it now. Journalism such as yours, is the first refuge of the scoundrel. So whatever you do is expected and accepted behaviour. The next issue would be is hitting back fair. To get that far we first need students with the time and energy to take Mr Mathews to court for invading their privacy. Since our academic schedules don't allow that, a fat lip seems a meager compensation. I had gone to odyssey to buy some ethnic books - books by Indian publishers with excellent ethnic illustrations. Of course, the useless store had nothing, but they had made room in their basement for showcasing Pottikadai. And no, i don't mean the small mom and pop stores found in very part of chennai. I mean this. 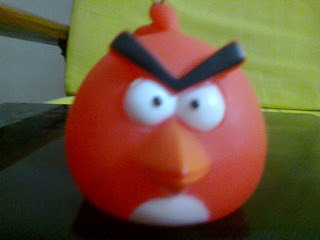 They had a basket of Angry Bird Key Chains, big fat toys with a key ring attached. I was wondering why this disproportionate size while extorting my angry bird crazy toddler to go for a sticker/pin/crayons. I picked one and looked underneath, I could see some raincoat like material stuffed inside and couldn't pull it out easily. I assume it would expand and contract like a bellow and dropped it back. As I looked up from dropping the keychain, I noticed an angry bird bag hanging off the shelf. Then it all clicked in place. The stuffing inside the angry bird was a bag! The bird also doubles as a coin purse! Once every couple of months I try to clean up all the lentils and beans stocked in my Pantry before I restock. I always replace Toor Daal (Staple south Indian sambhar), Urad Daal (Idli dosa ingredient) and Moong Daal (easy to digest) as soon as they get used up. The rest - Chana, Rajma, Back Masoor, Yellow Masoor, Green Whole Mung, Black Chana, Black-eyed peas, Red Karamani, Yellow Peas, procured Lima Beans, butter beans, Thatta Payiru get cycled. I make it a point to buy low quantities of all these except Chana and Masoor. Chana and Masoor are versatile and work very well in many dishes. This again is rescue cooking - Pantry rescue. I love to cook in earthenware pots, looks pretty and supposedly very healthy according to all the siddha medicine doctors. 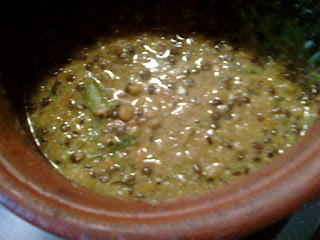 Daal cooked in such pots is supposed to be very tasty, but, my palette is not sensitive enough to identify such gastronomic differences as steel/earthen pots. I loved the last elimination challenge in Masterchef Australia Season 4 - cooking with 8 ingredients in the first round, 5 in the second and 3 in the last. Cooking up recipes with just 3 ingredients and staples sounds like a lot of fun. The staple in indian cooking would be a basic tadka with mustard and jeera (heat oil, add mustard jeera, let it pop then use as desired). I would also add turmeric, green/red chili, salt to the staples list. Mananthakkali or Black Nightshade has been around since paleolithic time, predates agriculture, used medicinally, healthy and high in antioxidants like most other greens, forms famine food in famine hit Africa but it is considered a weed amongst cultivated crops like cotton! Sad no? It is a tad bitter and only my MIL and I liked the chutney I made with it a while ago. 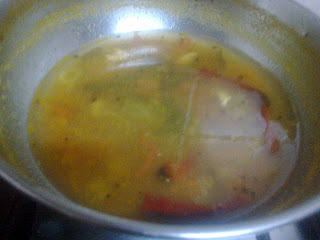 I disguise the keerai in other dishes - Sambhar, Salad etc... 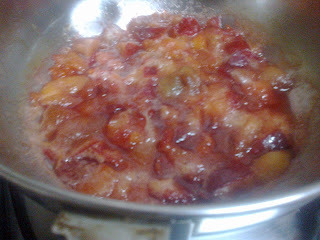 I love the dried berry and use it invariably when I make vatral kuzhambu. My mother would make Moar Kuzhambu (spiced buttermilk soup if you must) when she had yogurt that had gone too sour for eating. I make paneer (Indian Soft Cheese). Boil milk, after 5 minutes, stir in the yogurt and a tsp of lemon juice or vinegar. Turn the heat on to a low and stir milk occasionally until the whey looks fairly clear and all the solids separate. Drain onto a cheesecloth and use. 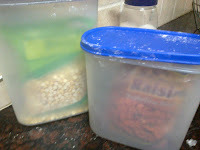 You can save the whey also to mix chapathi dough, cook daal or even rice. I use this paneer in Paneer Butter Masala or veg burgers. 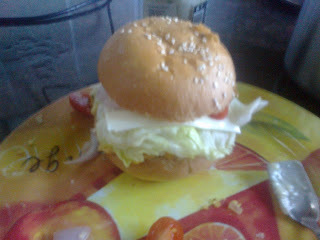 I had Burger Buns, Barely sprouted Moong beans, Potatoes, Cucumber and the usual fixings for a veggie burger. I had to make my son his fortnightly Burger Lunch. Mung beans tend to be a tad soggy despite using little water for cooking. Adding Pottukadalai powder helped dry up the patty. A much healthier options than using bread crumbs for this purpose. This is going to be my mornings from now on. Gau will eat a muffin before school. I will bake muffins once or twice a week, in the morning. Weekday morning at that. My prep work should cover any chopping, grating, slicing, buying, gathering necessary for the muffin. Morning work will be limited to mix pour and bake, between making breakfast and lunch for all of us. Muffins are not breakfast per se, they are more of a pre-breakfast snack for both the kids and the hubby. The older one has breakfast at school, the younger one around 10 at home. My last veggie shopping trip, the little one demanded grapes. This being off season for grapes the one I tasted made my mouth pucker. I compromised and got him Indian Plums. His crush on plums lasted until we got home and he bit into it. He quickly switched allegiance to the apples in the bag. 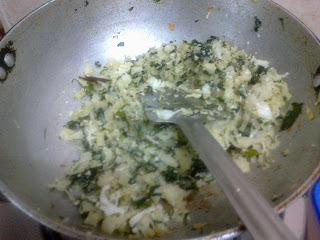 Preserving the stems of the various greens (keerai), when tender, we bought for making a daal/sambhar. Making Bassar (a sort of soup) with the water from cooking french beans. My grandma considered mom's cooking weird, she primarily liked English Vegetables, she hated keerai and found using stems and leaves of regular vegetables a tad cheap. She also stuck to traditional methods of cooking. My mother on the other hand, had a insatiable curiosity about all the different kinds of vegetables/daals and different ways of cooking them up. She collected recipes voraciously and even played around with traditional desserts (Sacrilege!). Yet another weekday morning and I had no baked goods for my son's breakfast. I did however have 3 organic lemons, 1 avocado languishing in my fridge from the previous week's organic market and this months eggless baking challenge still pending- lemon coconut bread. I had no coconut however and no time to buy 1, break and scrape at 7 in the morning with the day's work still ahead of me. 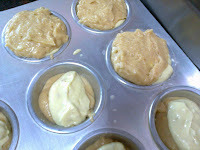 I decided to make a healthier muffin with the same core ingredient lemon. Remember the story of the Stone soup, weary Traveler(s) tricking the villagers into contributing ingredients to make a nourishing pot of soup? Every morning is a stone soup in reverse for me, I have to trick my son into eating something before he leaves for school. The days where I could threaten him with dire health consequences are long gone past, now I have to tempt him with a little chocolate first. All baked together in single serve sizes, it is basically a Muffin! Not a cupcake with its high butter to other ingredients ratio, but a Muffin. Preferably with a light crumb, but a dense one will be tolerated if the chocolate ratio is sufficiently high. Why am I so obsessed with the number 2 these days? Is it having two sons? Anyway July's challenge was baking egg free lamington. Gayathri chose David Leobovitz's blog, one of my favourite dessert sources, so I did not try any hacking or adaptations of my own; I simply made my favourite egg free sponge and then made the icing as per David's website. The results? Awesome! 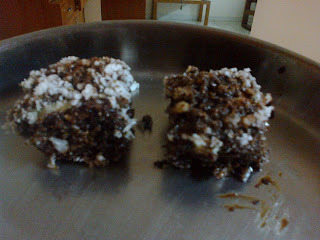 One tiny change which I made and loved is adding a coffee flavour to the icing and the cakes. Also I baked my cake in a round pan - no square pan at home. I set my alarm for 5 every morning, which means I am up by 5.40 atleast. Yet, I leave for work at 9.20 at the earliest, 10 at the latest! This month my goal is to figure out what delays my mornings, why I need 4 hours to get out of the house. My goal is to reduce all the above to 2 - 3 hours so that I am out by 8.00. I had a dry run yesterday, and today was bad, very bad, so I will account for this exercise from 31st July itself.